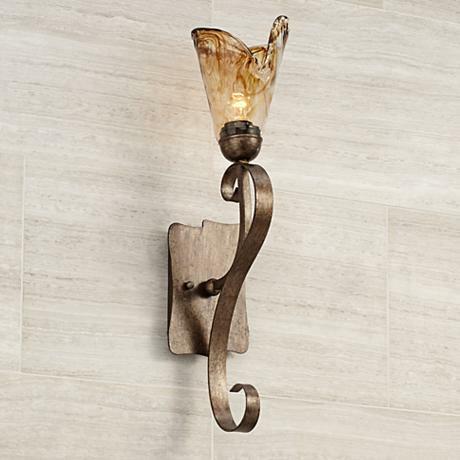 Free-form amber art glass creates a distinctive look for this stunning wall sconce. It's smooth lines are the key to understated elegance. Classic scrolling forms create drama, while the centerpiece is free-form amber art glass. A bronze finish with gold and silver highlights adds richness and nuance to this wall sconce design. • Organic Amber wall sconce. • Bronze with gold and silver highlights finish. • Free-form amber toned art glass. • Design is by Franklin Iron Works. • Extends 7 3/4" from the wall.